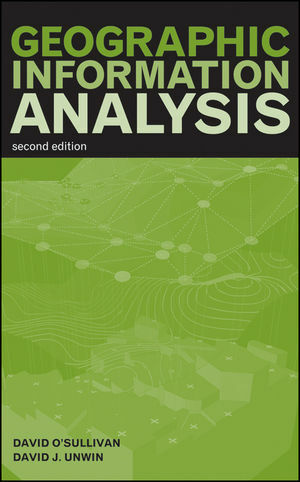 Geographic Information Analysis, Second Edition is fully updated to keep pace with the most recent developments of spatial analysis in a geographic information systems (GIS) environment. Still focusing on the universal aspects of this science, this revised edition includes new coverage on geovisualization and mapping as well as recent developments using local statistics. Building on the fundamentals, this book explores such key concepts as spatial processes, point patterns, and autocorrelation in area data, as well as in continuous fields. Also addressed are methods for combining maps and performing computationally intensive analysis. New chapters tackle mapping, geovisualization, and local statistics, including the Moran Scatterplot and Geographically Weighted Regression (GWR). An appendix provides a primer on linear algebra using matrices. Complete with chapter objectives, summaries, "thought exercises," explanatory diagrams, and a chapter-by-chapter bibliography, Geographic Information Analysis is a practical book for students, as well as a valuable resource for researchers and professionals in the industry. David O'Sullivan, PhD, is Associate Professor of Geography at the University of Auckland, New Zealand. David J. Unwin, MPhil, formerly professor of geography at Birkbeck College in the University of London, UK, is now retired. He is also the co-author of Computer Programming for Geographers (with J.A. Dawson) and coeditor of Visualization in Geographic Information Systems (with Hilary M. Hearnshaw), both published by Wiley. 1 Geographic Information Analysis and Spatial Data. 1.4 Scales for Attribute Description. 1.5 GIS and Spatial Data Manipulation. 2 The Pitfalls and Potential of Spatial Data. 2.2 The Bad News: The Pitfalls of Spatial Data. 2.3 The Good News: The Potential of Spatial Data. 3.1 Introduction: The Cartographic Tradition. 3.3 The Graphic Variables of Jacques Bertin. 3.6 Mapping and Exploring Points. 3.7 Mapping and Exploring Areas. 3.8 Mapping and Exploring Fields. 3.9 The Spatialization of Nonspatial Data. 4 Fundamentals-Maps as Outcomes of Processes. 4.1 Introduction: Maps and Processes. 4.2 Processes and the Patterns They Make. 4.3 Predicting the Pattern Generated by a Process. 4.5 Stochastic Processes in Lines, Areas, and Fields. 5.2 Describing a Point Pattern. 5.3 Assessing Point Patterns Statistically. 6 Practical Point Pattern Analysis. 6.1 Introduction: Problems of Spatial Statistical Analysis. 6.2 Alternatives to Classical Statistical Inference. 6.4 Point Pattern Analysis in the Real World. 6.7 Cluster Detection: Scan Statistics. 6.8 Using Density and Distance: Proximity Polygons. 6.9 A Note on Distance Matrices and Point Pattern Analysis. 7 Area Objects and Spatial Autocorrelation. 7.1 Introduction: Area Objects Revisited. 7.2 Types of Area Objects. 7.3 Geometric Properties of Areas. 7.5 An Example: Tuberculosis in Auckland, 2001-2006. 8.1 Introduction: Think Geographically, Measure Locally. 8.2 Defining the Local: Spatial Structure (Again). 8.3 An Example: The Getis-Ord Gi and Gi Statistics. 8.4 Inference with Local Statistics. 8.6 Conclusions: Seeing the World Locally. 9 Describing and Analyzing Fields. 9.1 Introduction: Scalar and Vector Fields Revisited. 9.2 Modeling and Storing Field Data. 9.4 Derived Measures on Surfaces. 10 Knowing the Unknowable: The Statistics of Fields. 10.2 Regression on Spatial Coordinates: Trend Surface Analysis. 10.3 The Square Root Differences Cloud and the (Semi-) Variogram. 10.4 A Statistical Approach to Interpolation: Kriging. 11 Putting Maps Together—Map Overlay. 11.2 Boolean Map Overlay and Sieve Mapping. 11.3 A General Model for Alternatives to Boolean Overlay. 11.4 Indexed Overlay and Weighted Linear Combination. 11.6 Model-Driven Overlay Using Regression. 12 New Approaches to Spatial Analysis. 12.1 The Changing Technological Environment. 12.2 The Changing Scientific Environment. 12.5 The Grid and the Cloud: Supercomputing for Dummies. 12.6 Conclusions: Neogeographic Information Analysis? Appendix A: Notation, Matrices, and Matrix Mathematics. A.2 Some Preliminary Notes on Notation. A.3 Matrix Basics and Notation. A.5 Solving Simultaneous Equations Using Matrices. A.6 Matrices, Vectors, and Geometry.